Promate is a company with a reputation for solid workmanship and incredible quality. All of the products that they design are aimed at enhancing the dive experience whilst ensuring safety at all times. The knives that they produce come with a commitment to 100% customer satisfaction and are designed to stand not only the test of time, but also the rigours that await in the underwater world. The Promate Titanium Folding BC Knife is the perfect pocket sized knife for divers of all abilities no matter where in the world you dive. The durability of the blade on the Promate Titanium Folding BC Knife is without question, the resistance of titanium to rust and abrasion means that this is a piece of equipment that is going to stand the test of time. The poly-carbonate handle ensures that the knife is not too weighty in the hand or too heavy to be carried in the pocket, or attached to a belt. 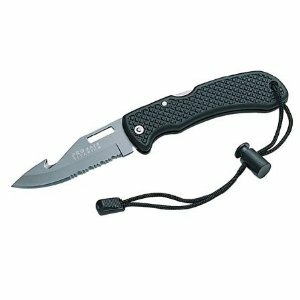 The thumb opening slot makes opening and using the knife simple and straightforward and the hook is sharp enough to cut through any amount of line should the need arise. One of the benefits of the hook design being that the knife does not need to be unfolded to use it as a line cutting tool. Whilst the hook is of great benefit as a line cutting tool it is accessible at all times and can cause damage to hands and fingers if the diver is not careful, this would not be an issue if the whole blade was sheathed but that would negate the whole benefit of the folding design. Anyone looking to use the Promate Titanium Folding BC Knife away from the scuba environment is leaving themselves open to injury as the knife if not meant to be carried in the pockets of clothing, the readily accessible hook with catch can cut anything that comes into its path, fabric or fingers. Whilst the lanyard makes it easy to attach to a divers belt or vest, the reach of the lanyard is limited, a coiled design would perhaps have been a better design feature for this model. The Promate Titanium Folding BC Knife is a basic good quality knife that will make a great first knife for a diver. Currently retailing for $19.95 it means that it is in an easily accessible price bracket for just about anyone looking to invest in their equipment. Whilst there are some design features that could perhaps have been better thought out and put into practice, providing the knife is stored and used correctly, i.e. in the scuba environment and not just in the pocket of your shorts there is no reason why this knife should not be one piece of equipment that you keep in your scuba kit for years to come. This entry was posted in Dive Knives, Reviews, Scuba Diving and tagged Promate, Promate Dive Knives, Promate Titanium Folding BC Knife. Bookmark the permalink.